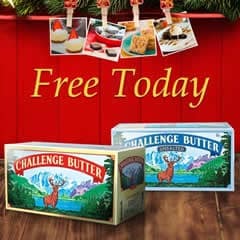 Head over to the Challenge Butter Facebook page for your chance to win free Challenge Dairy products. This freebie goes live today at 3 p.m. The first 100 eligible entries will get a voucher for free butter or cream cheese. This offer ends December 15th. There is a limit to one entry per person. Make sure you “like” the page for your chance at a free sample.